Field surveys are completed in the Toloka mobile apps for Android and for iOS. A performer chooses a point on the map where they need to go to check something and take photos. Suppose you want to check the condition of squirrel feeders. 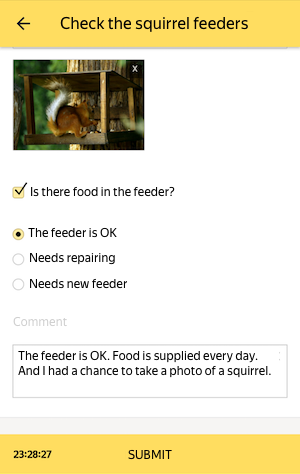 To have this done, you should create a task as follows: a performer has to upload two or more photos, check if there is any food and assess the feeder condition. Click the + Create a project button and choose the Field mission template. Write short and comprehensive instructions (see recommendations). Use HTML tags to insert links, pictures, and so on. Instructions for the field survey should be easy to read, even on a mobile phone screen. In the template, the Map option is enabled automatically. 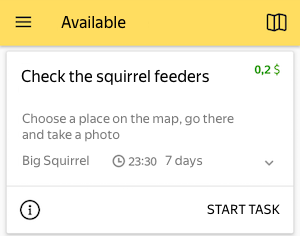 So a user will see tasks as points on the map and be able to choose any. When chosen, the task's Title and Description are displayed. These fields contain an input field that will be changed later. Input data field — The name string for the point name. photo array of files — The photos that the performer will upload. comment string — A comment by the performer. Input data field — The description field for sending the location details. condition — An optional string to save the radio button value — the feeder condition. worker-coordinates — A required field with coordinates. To record the performer's coordinates to it automatically, turn on the Current position option. 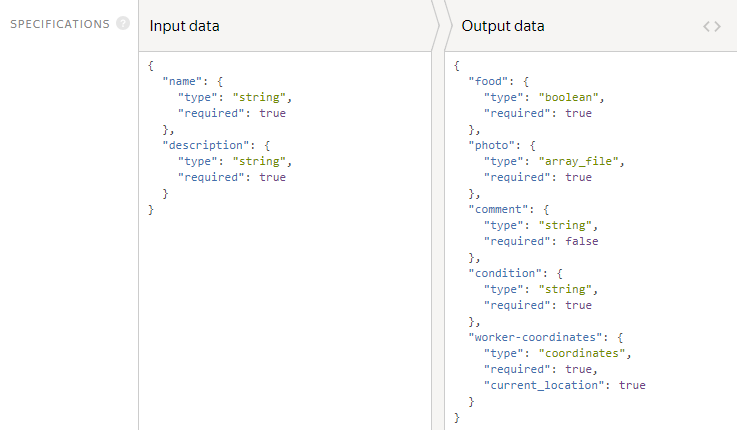 You can use standard HTML tags and special expressions in double curly brackets for input and output data fields in the HTML block. Name name and location description. Button for uploading photos that will be recorded in the photo file array. 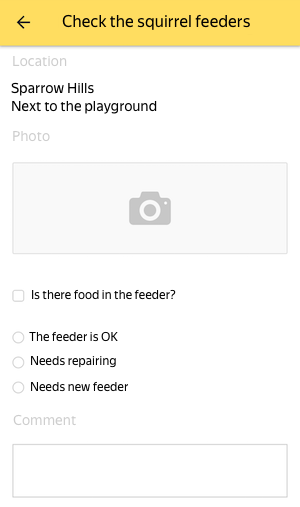 A checkbox with the value (true or false) output to the food field. Three radio buttons with the chosen value output to the condition field. Set the price per task, for example $0.2. For field surveys, always add one task per page. Set the Time allowed for completing a task page. It should be enough to get to the place, find the specified point and upload photos. For field surveys, we recommend allocating a day — 86,400 seconds. Set an Overlap, which is the number of performers to complete the same task. For field surveys, it is usually 1. Add Filters to choose performers. To make your tasks available in the Toloka mobile app to English-speaking performers located in Moscow, set the language and region. Add input data in it. The header of the input data column contains the word INPUT. For field surveys, you also need to specify the latitude AI:latitude and longitude AI:longitude of the point. 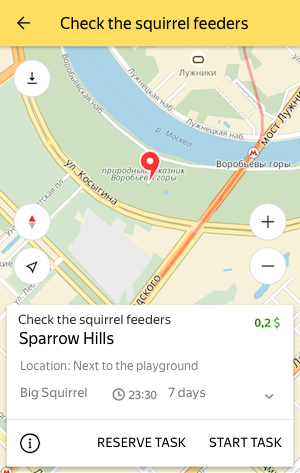 For instance, you can use Yandex.Maps to get the coordinates. 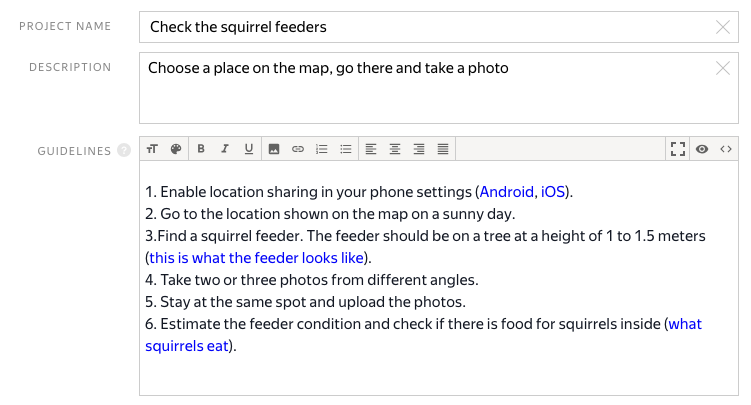 Upload the tasks by choosing Set manually and set 1 task per page. When the first results come in, you can start reviewing. When the deadline expires, all responses are automatically accepted, regardless of the quality of the response. To review assignments, go to the pool and click Download results. To download attachments, click the button next to and choose Download attachments.